Hey guys! Its been a while since I did a product review but I just had to make time to tell you ladies and gentlemen about a new product I have decided to try! 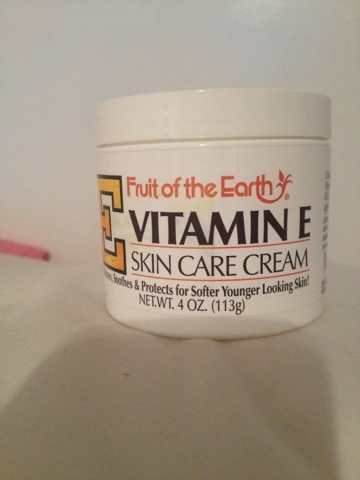 It is Vitamin E skin care cream by Fruit of the Earth. COST: This cream was purchased at walmart two 4ounce jars came in one pack for 3 dollars and some change tax included. Compared to other creams and lotions I have used of higher prices ive noticed a change in my skin the first week using this particular cream. Let me remind you I am 38 weeks pregnant and my skin has stretched ALOT but ive definitely noticed my stretch marks less red than when i was using palmers coco butter. QUALITY: I would rate this a 5 for quality because it doesn't feel like a cheap cream. It is very thick and creamy but absorbs very quickly on the body and doesn't leave you feeling sticky or nasty. The smell is phenomenal! After using this I don't think I will ever spend my money on the overpriced name brand lotions. All in all if your looking for something that will moisturize,sooth and protect your skin this is the product for you and the unbeatable price makes this even better!! Please if anyone else tries it let me know how it goes for you! I would love to hear if it works well for you skin or even if it doesn't let me know what does I may want to try that as well! I have decided to try! It is Vitamin E skin care cream by Fruit of the Earth. Best Facial For Dry Skin - For those with dry skin Elmore Classic is the one cream that will suffice for their extreme moisture requirements. A truly classic product is reminiscent of moisturizers being used for centuries, but with a modern edge that is truly unique.